Although Darren Aronofsky has directed only three films (Pi, Requiem for a Dream and The Fountain) he is one of my very favourite directors. I travelled more than 600 km just to watch The Fountain on the Thessaloniki Film Festival (along with Inland Empire and Pan's Labyrinth)! 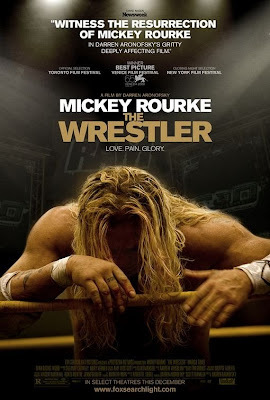 His new film, titled The Wrestler, has won the Golden Lion on the Venice Film Festival and is already generating Oscar buzz, with people saying that Mickey Rourke gives the best performance of his career and will probably be nominated for an Oscar. From what I can see in this trailer those claims are not unfounded (click on the link for glorious quicktime!). Definitely one of my must-watch fims!